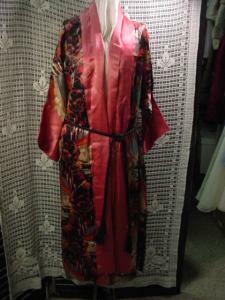 This is a wonderful full length satin robe with a deep rose shawl collar that runs the entire length of the robe. The 3/4 length sleeves also end in this deep rose color. The pattern in the material is outstanding. I wish I knew my history because this robe looks like it is celebrating the exploration of the north or south pole. The pattern has a sailing ship and iceburgs--very colorful. The original tasseled belt is on the robe. The robe measures 42 inches across the bust and 42 inches from the top of the shoulder to the hem. The sleeves are wide dolman sleeves almost imitating a kimono. The robe has no closures and is worn open with just the belt. It is in excellent condition. I have never seen this pattern. This is truly unique and a wonderful find for any vintage lover and it could be worn by a man or by a woman.